Investment in Dubai’s real estate market has remained persistently strong on the back of superior rental yields properties in the emirate offer.Compared with global realty hubs like London and Singapore, the return on investment from properties acquired in the Dubai stands head and shoulders above international compatriots. Over the months, Bayut has noticed yields for various property types in Dubai go as high as 14%, explaining the obvious allure of the city’s real estate sector for investors. For those still harbouring doubts, we list the Dubai areas where investment in apartments returns the best rental yields. Bordering Sharjah and located right behind Dubai International Airport, Al Qusais enjoys a premier location in the city. As a large and established development, the suburbs of Al Qusais are popular among Asian expats and locality has important developments like Al Nahda, Rashidiya, Al Twar, Muhaisnah, Hor Al Anz and Al Qiyadah as its neighbours. Rental yield for apartments in Al Qusais topped our list in July 2016, fetching fortunate owners 12% on their investment. Judging from the returns the locality offers, investors can earn close to 60% of their capital invested in a mere five years. It wouldn’t be incorrect to say that Al Barsha locality is situated in the heart of Dubai along the main Sheikh Zayed Road. The large development is home to various high-end hotels, numerous malls and quality residential communities accessible by multiple metro stations. Apartments in the area returned an average yield of 10% to landlords as of July 2016. Tucked away in the southern corner of Dubai, Al Furjan is a quiet community with relatively new structures. We believe that the locality’s situation away from the fast-paced life of Dubai, plenty of green spaces and the newness of its structures are the main reasons for its popularity with tenants. Investors who rent out apartments in Al Furjan also earn an average rental yield of 10%, according to our data for July 2016. There were quite a few areas where investment in apartments returned an impressive yield of 8%. These areas are spread all across Dubai – some in the centre others in suburbs – each having its own unique feature. These include the fast developing Downtown Jebel Ali, the highly popular International City, Dubai’s busy cultural hub Bur Dubai, The Lakes, Dubai Investment Park (DIP), the amenities-laden Dubai Sports City, the green and serene Dubai Silicon Oasis, Al Sufouh and Jumeirah Village Circle (JVC). All of these areas are highly popular with tenants due to the quality of structures, peaceful living environment and in some cases, affordable rents. 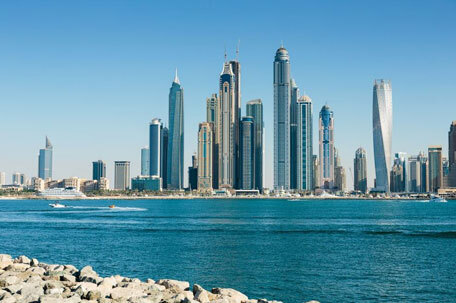 If you are thinking of making your first investment in Dubai, make sure to consider these areas to earn maximum rent or consult our website to find the deal you have been looking for all along.